SCRIPT ALPHABET PATTERN Create Crochet Text without the Colorwork! Crochetpreneur > Crochet Patterns > All Crochet Patterns > Create Crochet Text without the Colorwork! Since the first time I saw a “hello” pillow, I’ve wanted to jump onboard the text trend and create some home decor pieces with text incorporated into the design….but OMG the thought of colorwork and end-tucking kept me from ever giving it a shot. Well, thankfully, today’s guest designer, Emily Lagler, from The Home MAKEr by Emily brings us a way to create crochet text WITHOUT colorwork! Emily’s piece is perfect for Valentine’s Day and, while her example is appliqued to a handsewn pillow, you can do the same with your favorite crochet pillow pattern. I’m even thinking of adding some text to my favorite sweatshirt! I know you’ll want to get creative with your sayings so Emily has made her alphabet pattern available for you to customize as you please and she’s even giving Crochetpreneur readers a coupon code for $1 off your purchase of the patterns. You can find them on The Home MAKEr by Emily Etsy Shop. Be sure to use the code: LOVEPAM for your discount. When I was a little girl I loved going through boxes of long-forgotten things. At my grandma’s house, I would look through her closets in search of treasures from long ago, belonging to people with whom I shared a name, but never knew. I was taken by the photographs of my parents and grandparents disguised as younger people and wondered who they had been. So when I found a crochet hook in some of my mom’s things I was instantly curious as to what it was and what it was used for. I dug up some yarn from somewhere and the ember that would ignite my love affair with the art of crochet was in place. My grandma crocheted for as long as I can remember. Every Sunday afternoon of my childhood was spent at my grandparents’ house and more times than not my grandma had a hook and yarn in her hands, blindly, skillfully, adding row after row to whatever creation was currently in her queue. Even with these early sparks, that ember would take a while to catch fire. It would be years before I picked up that slender piece of metal and that seemingly never-ending strand of spun fiber with the intention of making something out of nothing; choosing color, stitch, and vision and turning it into beauty, an object to be revered. Now I will admit, the first few items that emerged from my hook and inexperienced fingers could politely be described as juvenile, unsophisticated, and accidental. I did my best to follow the instructions that were spelled out in the Reader’s Digest Complete Guide to Needlework, passed along by my mom, but I could never get my hook to maneuver just so. As a little girl and later, as a recent college graduate, I flipped through those pages in awe of each stitch, each completed piece, imagining what I could create. (This book was copyrighted in 1981, so by today’s standards the items that were promised were…well…outdated). That didn’t stop me from dreaming and it did nothing to quell the ember that was now a small flame. Because of my experiences with crochet, I have a special place in my heart for those pieces many would label as “old”, “outdated”, “not on trend”, or just plain “ugly”, but it’s these pieces and so many that came before them that laid the framework for the modern crochet we do today. What we know and love as crochet today first appeared in the 16th century, although it’s true origins are unknown. The art of crochet and its patterns traveled through time by word of mouth, bringing with it new skills and different fibers as it passed through the hands of countless (mainly) women. Each of these new skills, stitches, and techniques wrapped itself around early crochet, much like we might wind our favorite ball of yarn until it grew into each and every one of the patterns, projects, and businesses that we just can’t seem to tear ourselves away from. Crochet has blossomed into everyday beauty and endless possibility, allowing ourselves a (much needed!) creative outlet and, for many of us, a way to make a living. Many people think of crochet and automatically think of cold weather wear…scarves and blankets, hats and mittens. Oh, but it is soooo much more! Enter, my crochet alphabet. I started my business a few years ago, filling orders for your run-of-the-mill requested winter items. And I loved it! I was tickled that people were placing orders with me and that I actually had a profitable (if only slightly) business. Then I started thinking “Hmmmm, why can’t I design and write my own patterns?”, and I did just that. I started with some beginner friendly pieces like a boot cuff and ear warmer set, a big comfy triangle scarf, and the obligatory messy bun hat because you just can’t be a legit designer without the infamous messy bun hat pattern (am I right?!?). Then one day, I was searching for a fun font to use for a wooden sign I wanted to paint for my house (because l have ADD and can’t stick with just one craft🤦🏼‍♀️). I came across some playful, script-y fonts and a light bulb went off. “These would be super cute in crochet!! !” I hurriedly threw the sign aside, dug through my junk drawer for a pencil and paper, and grabbed a hook and some yarn. It was a bit of an arduous process at first, as I would only have labeled myself (just barely) an intermediate crocheter when I started the alphabet project, but I got into a groove and cranked them out one by one and before I knew it I had a whole alphabet! These letters have been so much fun to play with! I have so many cute ideas I want to try out, but there never seems to be enough hours in the day (who’s with me???🙋🏼). Sew your initial on your favorite sweater to give it a new lease on life. With Valentine’s Day right around the corner, I just had to make a project using the word “love”. Before my husband could protest yet another trip to the craft store, I was in the car, head swimming with ideas, excited by the promise of a new project. I strolled up and down the yarn aisle, searching for that perfectly love-ly shade of pink. For this project I decided to use #5 crochet thread and a size 6 (1.75mm) hook to achieve the size I was looking for. I found some romantic, rose-covered white fabric and some grey cotton gauze fabric to add a bit of a shabby chic look. I made up a quick envelope pillow cover (so I could remove it for easy washing). Then I frayed the gauze a little to stick with the shabby chic theme, hand-sewed “love” to the gauze using the crochet thread, and used fabric glue to attach the gauze to the rose fabric (I liked the look of not having visible stitches showing on the gauze). For those of you that don’t have a sewing machine or just want to keep this project a little quicker and simpler, you could just as easily use a store bought pillow and attach the word. I just love the way this turned out! And because it’s not overly Valentine-y, I can use it year round as a pretty throw pillow on the couch or to give my bed a little touch of elegance. I love that crochet gives me this fun, creative outlet. I love that there’s freedom in the art of crochet to do the ordinary and the out-of-the-ordinary. I love that I’m using the skills that have been passed down to me through two generations to leave my mark on the world. And I love that you joined me for this project and hope you’ll come back for more! It’s supposed to snow this weekend in my neck of the woods, so I’m going to use that as an excuse to grab some pink and red yarn and get creative. Maybe a cute “love, love, love” garland to hang on the mantel or just a simple “love” table runner for my dining room table. Depending on how much snow we get I might just get to make all the things!!! What are you going to make? Enjoy my letters and Happy Making! For more ways you might use Emily’s letters, check out this post on How to Make Personalized Wall Decor! Hey! It’s Pam again. Is this project gorgeous!? 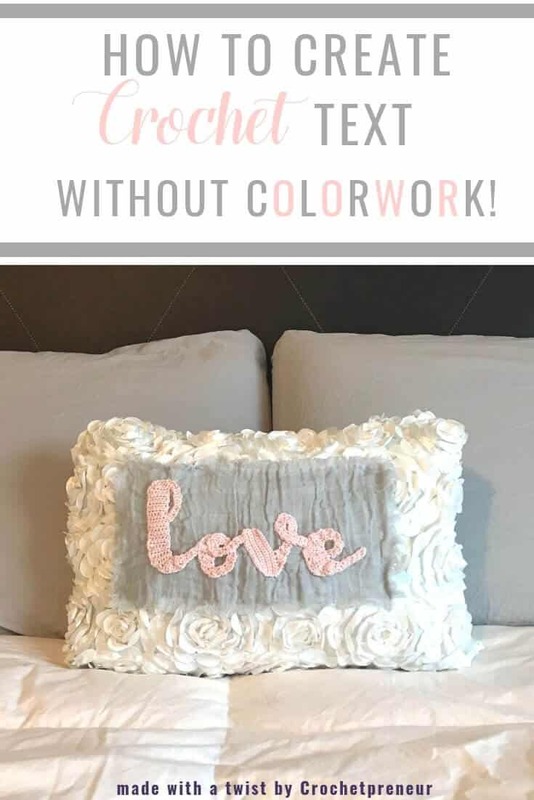 If you’d like to create your own crochet text “love” pillow or you’d like to get creative and design your own word or phrase, you can get Emily’s alphabet letter pattern, on her Etsy shop. Be sure to use the code LOVEPAM at checkout to get your discount for Crochetpreneur readers only! I can’t wait to see what you make, be sure to tag me @thecrochetpreneur on your social media posts so I can show you some love! Bookmark this article Create Crochet Text without the Colorwork!